Oh, that’s a 2017 toaster? Smart home technology – and we're specifically thinking here about white goods – has a problem that no one seems to be talking about. 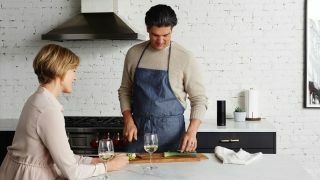 For many years we’ve been hearing keynote speeches at CES about how all of our kitchen devices are going to be able to talk to each other, and it seems like 2018 is the year that a few companies will actually manage to crack it. During its CES keynote, LG showed off a smart fridge that can display recipes on a screen on its door, and, when you start cooking, can automatically turn the oven on and preheat it to the right temperature. Samsung likewise was touting its range of smart kitchen tech that can all be controlled from one slick interface in the Family Hub fridge. This is thanks to Samsung's industry-leading work with its SmartThings hub. It also announced that SmartThings is coming to the Gear S3, so you'll be able to control your home from your watch. Given that it’s Samsung, the announcement mentioned Bixby, its own take on the voice assistant. This means we’re genuinely entering the age where you’ll be able to pop to the shops, and, while you’re there, ask Bixby if you’ve got milk in the fridge. Heady times indeed. The problem is that technology becomes redundant at a far faster rate than the devices it's being put into. If you need to replace your phone every couple of years it’s inconvenient, but it’s not the end of the world. If your oven becomes worthless after four years, that’s a serious problem. Not only is it a significantly bigger financial investment, it requires specialist installation that's a much bigger upheaval than replacing a device you can fit in your pocket. Often a kitchen is designed with your key white goods in mind, so replacing them would mean your kitchen no longer works from a design point of view. We now live in a day and age where white goods shouldn't be considered luxury items, so a malfunction taking an oven or fridge out of action means you're suddenly faced with a major bill to replace something that's essential to your everyday life, so can't be put off to a more convenient time. One solution is to make these smart goods modular. If it was only the door of your oven that had technology in it, with the rest of it being a standard oven, then you’d only need to replace the door, not the entire unit, which would keep both the cost and the inconvenience to a minimum. Likewise, in the case of your smart fridge, creating a simple pop-out panel that houses the screen and speaker would mean manufacturers would simply have to comply with certain dimensions and coupling requirements when creating updates, and the user won't get saddled with the cost of keeping up with a constantly evolving market. Redundancy is a big issue at the moment, with Apple in hot water as its handling of the iPhone 6's obsolescence comes back to bite it in a big way, so manufacturers need to be giving serious thought to how this issue is going to be tackled. A couple of years ago it came to light that the McLaren F1 team had found themselves in a situation where their £10 million cars were having to be maintained using a Compaq LTE 5280 laptop from 1996, due to a compatibility issue that meant the computer couldn’t be updated. That's a major organization, with vast amounts of money to invest in keeping modern and a redundant technologies running simultaneously, but the reality for most of us is that once our smart speaker or phone overtakes our over by more than a couple of generations they're simply going to stop being able to communicate with each other. And we won't have McLaren's deep pockets or engineering dream team to fudge together a fix in time for dinner. Manufacturers are surely aware of this problem, so it would be nice to see what efforts are being made (if any) to stop this incompatibility from becoming a major issue in a few years' time. At the moment it's only high-end, luxury items that feature this smart technology, which means it may be a problem that only those that can afford such items will experience. But this technology will in time trickle down to more affordable devices, so the issue needs to be addressed, and soon. The answer may not be modular, but a solution needs to be found.